It’s finally here! 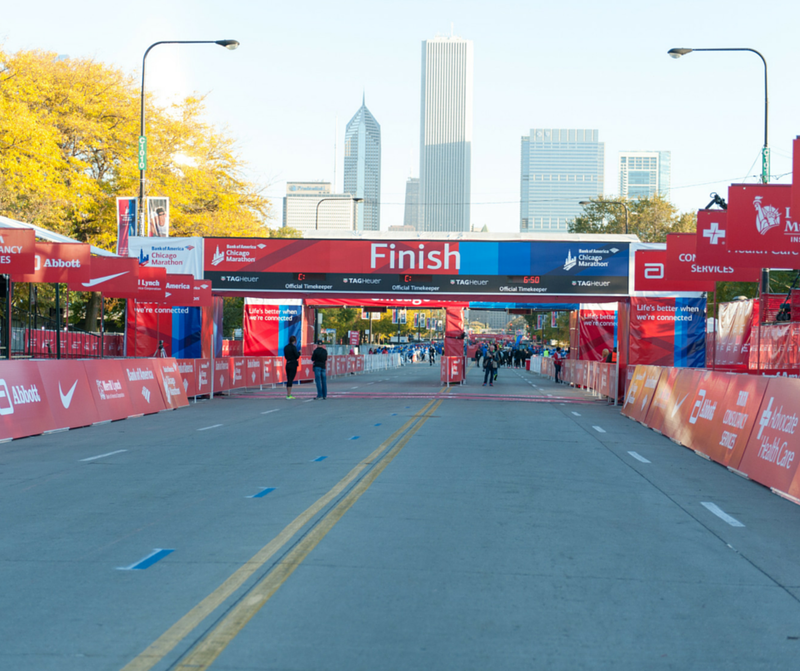 I’m very hopeful one week from right now, I will be a 2015 Bank of America Chicago Marathon finisher! However, this blog post is supposed to be about my first week of tapering for my 3rd full marathon. How did it go? Let’s look. Tuesday, I made it out for 4 more miles of training to begin the taper. This run was a really slow one. Part of that was intentional. I had a lower leg cramp show up in my 17 mile run two days before this one. So, I didn’t want to do anything to make this worse. Nothing would be more horrific than to push too hard in the taper and wind up with an injury that knocks me out of the race I’ve been preparing for over the last 4 months. Additionally, I was feeling a little tired from that 17 mile run. So, I started this run with the idea that it’s better to finish slow than to push too hard. Right from the first mile, I was going slow. I finished the first mile in just under 12 minutes. I still decided to switch gears in the second mile by going with a 60 second walk break (vs. the 90 second walk break I was taking in the first mile). The switch went off pretty well. I focused on finishing the run intervals and wasn’t too concerned with pace. Towards the end of mile 3, I felt that cramp come back. So, it wasn’t anything that was too much for me to continue. It was just a little twinge that happened. I decided to switch back to the 90 second walk breaks for the last mile. After all, I was going slower than usual. So, there was no good reason to push harder than I needed to. The adding time to my walk breaks worked out well for me as I didn’t have that problem again. It also helped me feel much stronger at the end. I ended up taking one mid-week run off because of that twinge. As I’ve researched this problem, I’ve learned that one of the reasons runners have this happen to them is by over-working the muscle. Another is from heat. The third most common reason is low levels of salt. Given that, I wanted to make sure over-working the muscle wasn’t a problem. So, that was my rationale for taking one mid-week run off. The taper period for this marathon is already one week shorter than I would have liked. So, I’m trying to be cautious and maximize the rest I can get. Saturday, I was up and out the door much later than the weekend before because I only had 7 miles to cover. 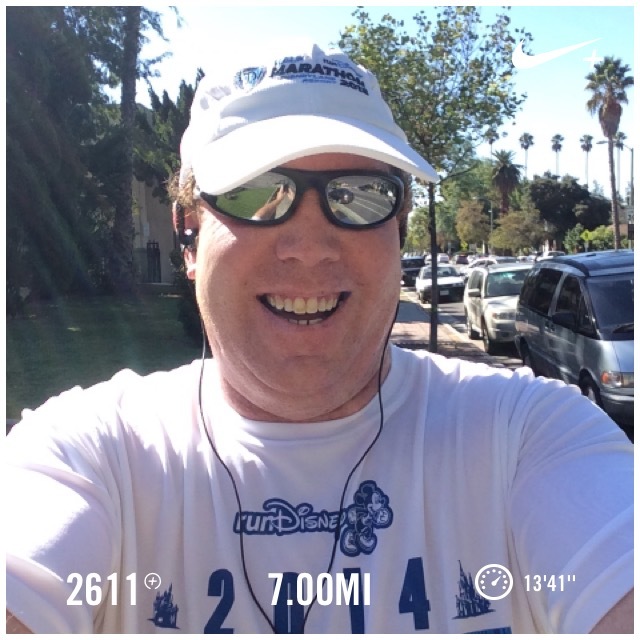 Even though it was going to be another warm 90+ high temperature in Pasadena, I only had 7 miles to cover. So, I could go out a little later. Unlike my LA Marathon last weekend run of 7 miles before the race, I decided to keep everything in check and just worry about getting the miles in. Some of the things that got me through this run without a terrible panic attack over the slow nature of it was that the temperature at the start of this run was already warmer than the projected high temperature in Chicago for marathon day. I was also running a coarse that had more incline to it than I will face for the entire Chicago Marathon. These are comforts. I got that slight twinge again in the 4th mile. 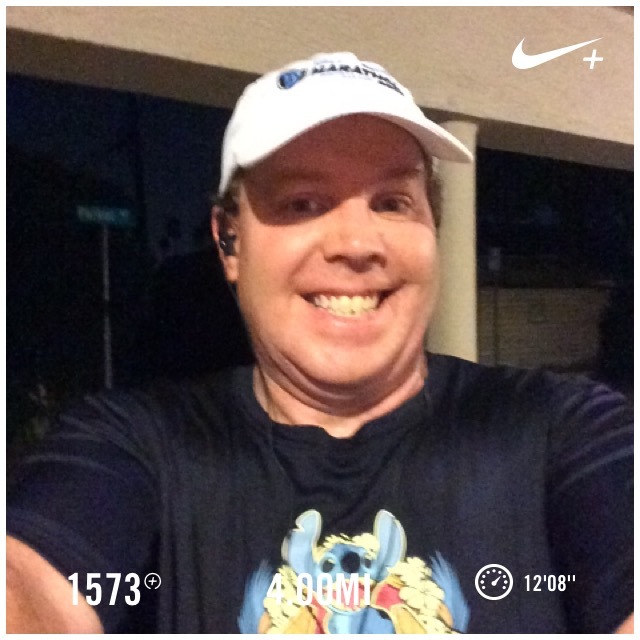 So, I walked a couple of my run intervals. After that, I had no more issues like this. Each run has the potential to teach you something new. On this run, I learned how to deal with that twinge should it pop up on the marathon day. Skipping a couple run intervals wasn’t the end of the world and it brought be back to the point where I could run the regular intervals once again without problem. My average pace of 13 minutes, 41 seconds over such a short distance would normally be concerning. However, it is taper time. The goal for the run was merely to get the miles into the legs while recovering from all the much harder runs. Mission accomplished! So, here’s the forecast for Chicago this week. As you can see, it looks like it should be a fine day for running a marathon on October 11th! I really like the temps right now and hope there isn’t much of a change. 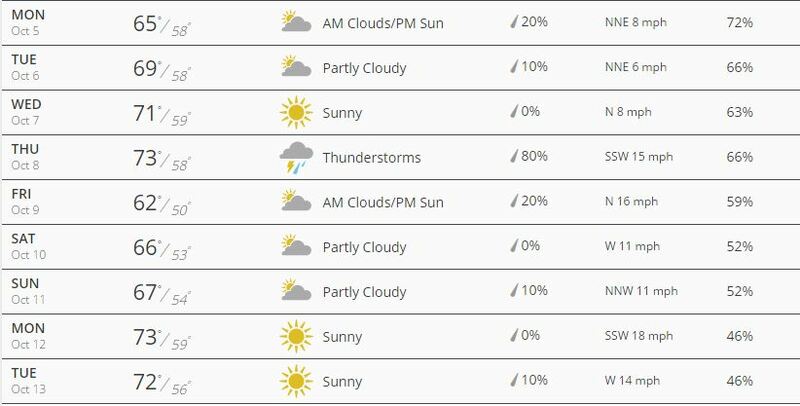 After so many miles in the sun, I will be very happy if this race is under partly cloudy skies. A high of 67? I can’t remember the last time we had that out here in Pasadena. This is not the temps I’ve trained in and that’s AWESOME! As for the fundraising? We have some money that we’re expecting to come in by Tuesday or Wednesday that should get me to the minimum needed! Hooray for that! The Crowdwise page will be active through the end of October. So, if you did want to make a donation, please click the link above to donate. I don’t have to raise the minimum and stop. It would be fantastic to see the money raised exceed the minimum. I still feel this is a very worthy cause. This will probably be my last push for money on the blog. However, I’ll keep the link up on the right hand side column until the end of the month. I’m at $1275 currently. I have another $55 that have been given to my wife and I in cash that we will be submitting either today or tomorrow. So, that brings the total we actually have to $1330 out of the $1500 I need. The monies we are expecting should show up by Tuesday or Wednesday evening. As you might imagine, now that I’m in Chicago Marathon race week, I have so many thoughts swirling around in my head. Over the weekend, I spent time getting a lot of the logistics worked out for the trip. I’ve also spent some time reading some of the blogs that were written from last year’s race and other articles about the race course. 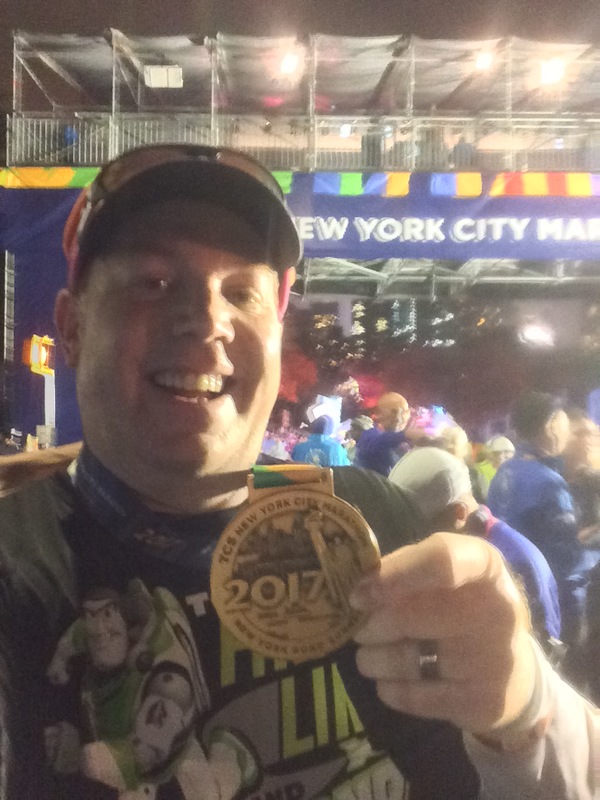 I’ve also taken the time to look at my training for this race and compare it with training for the 2015 Los Angeles Marathon and the 2014 Walt Disney World Marathon. It’s very interesting to look at the actual numbers and not just how you felt about them. One of the stats that popped out at me is that, by the time I get through my next two 4 mile runs, I will have logged more training miles for this marathon than I did for the Los Angeles Marathon. So, even though I didn’t finish a 23 mile training run this time around, I have put in more miles over the course of training. I’ll share more next time. so excited for you to rock Chicago this weekend! Looking back (now that I am running Long Beach), i should have just signed up for Chicago and used it as a training run-oh well! next time! Juliana, you have some crazy dreams! I mean that in a good way. You are one of the few people I’ve met that would even thing to run one world major marathon as a “training run” for another. Good luck to you running Long Beach this weekend! Don’t kill yourself. It’s going to be really hot out here.